Last year a unique situation occured that allowed us to verify the comb spacing and cell size claims made in regards to naturally built comb. We hived a swarm while short on frames, by the time we returned it had prolifically built a few large combs extending into a second brood box. We added frames to the sides but left the wild combs on the inner cover all season. 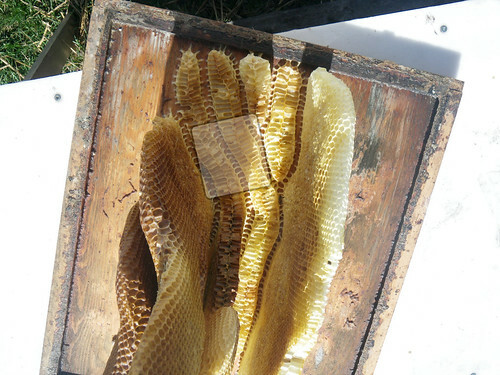 The comb spacing on the Hoffman frames typically used in the langstroth hive is about 35mm (1 3/8") and the cell size of standard foundation we use is 5.4mm. A quick glance at this hive was enough to make me feel the bees had decided on a much tighter spacing in some areas of their comb than our frames provide. Unfortunately, the hive didn't make it through the winter, but this did give me the opportunity to measure a comb design little influenced by top bars, frames, starter strips or foundation. First I measured the comb spacing. 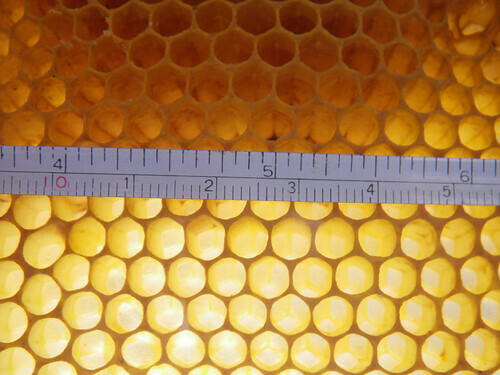 The above photo shows the distance from one comb's mid-rib to the next comb's mid-rib to be approximately 31mm. With the space between combs somewhere between 7-8mm. 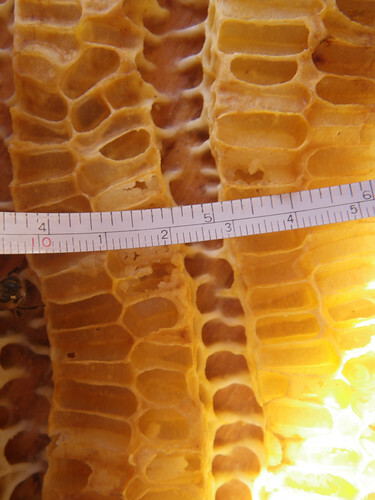 With cell size it is often suggested to measure ten cells across and average the result, as bees tend to build cells of variable sizes. The following was measured in the lower-mid section of brood comb. I've heard many claim that bees coming from a hive with standard foundation will build 5.1mm cells in their next generation of combs. This experience seems to confirm that. It is of course important to remember that comb spacing varies according to use. 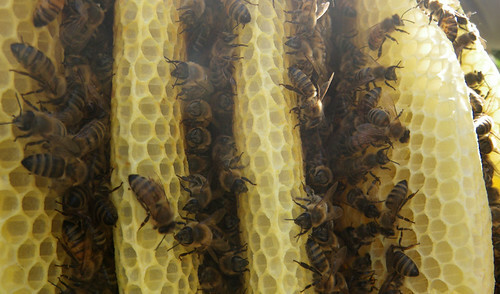 With honey and drone combs being wider than brood combs. The spacing used in a standard langstroth hive is really an attempt at averaging out the differences. I've been contemplating what frame spacing to use all winter while building hives for next season. Though I've seen the langstroth spacing work well enough, I'm tempted to see what advantage may come from using a variable spacing. It's become popular in the top bar community, where one can not rely on foundation for straight comb, to use 32mm (1 1/4") for the brood nest and 38mm (1 1/2") for honey combs. 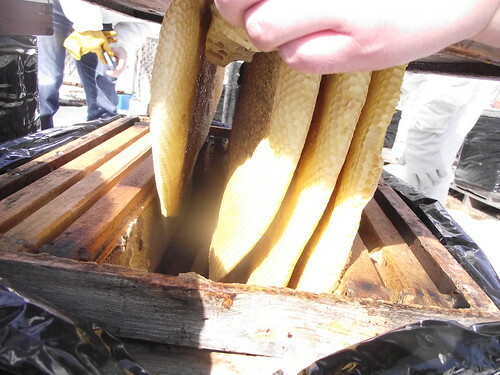 There is a great deal of speculation about the advantages of small cell bees and a corresponding tighter comb space. 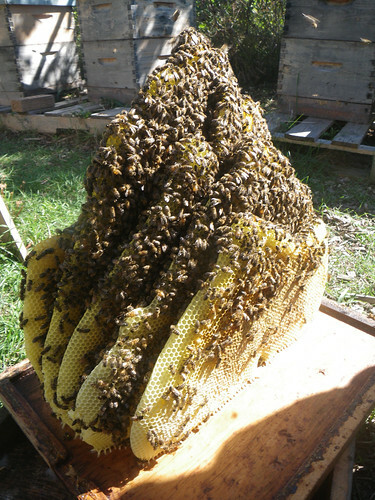 For me, the fact that bees seem to want to build cells and comb at various sizes when given the chance, seems like reason enough to set up the hive in such a way as to make this possible. Wish me luck. 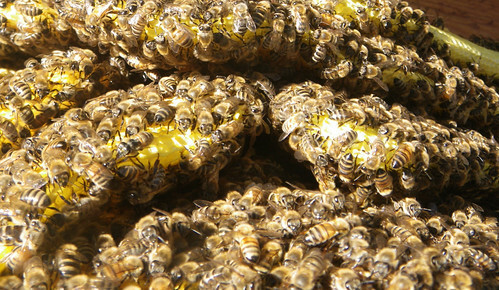 The discovery of the bee space is said to be the foundation of modern beekeeping. For a long time I thought it was a very simple matter and didn't give it much thought, but as I've been attempting to build my own hives I've discovered there's a range given for exactly what the bee space is (6mm - 9mm or 1/4"-3/8"). I've also learned I need to account for wood shrinkage and different parts of the hive need different kinds of space (ex. between boxes or between combs). In the linked article Dave Cushman's provides a great overview of important space dimensions used in different pieces of hive equipment.